Mental health author, mental health activist, physician and psychotherapist Terry Lynch believes that the current biologically-dominated approach to depression is wrong. The major flaws in the current medically-dominated approach to depression need to be made available to the public. This will facilitate the full and proper reappraisal of depression that is so urgently necessary. 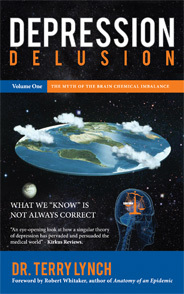 Depression Delusion Volume One: The Myth of the Brain Chemical Imbalance is an exposé of the widespread belief that imbalances of serotonin and other brain chemicals are known to occur in depression, and why this falsehood became so widely believed. Dr. Terry Lynch explains how this falsehood meets psychiatry’s own definition of a delusion and the central role of the medical profession in promoting and perpetuating this falsehood. This falsehood has seriously hampered the global search for greater understanding of depression, He describes a better way to understand depression. He describes psychiatry’s enormous vested interest in biological ideas such as brain chemical imbalances. He explains that known brain disorders are not diagnosed or treated by psychiatrists at all, but by neurologists and neurosurgeons. He warns of new delusional ideas being groomed to replace older ones, a practice that will continue as long as the public allow psychiatry’s continued and unquestioned dominance of global mental health. “Truly remarkable . . lucid, seamless and highly readable . . a vitally important work . . Please read this book, keep it close to hand for reference, and encourage others to read it also. Ask your library to buy a copy. The spurious chemical imbalance theory is now so widely accepted that it will take enormous efforts to dislodge it. In any debate on this matter, Dr. Lynch’s book will, quite literally, put the facts at your fingertips.” USA psychologist Phil Hickey PhD, book review, Mad in America website, 31st August 2015. “Eye-opening . . a scrupulous study of a topic that holds profound consequences for so many people.” Kirkus Reviews, USA. “Terry Lynch has given one of the most pervasive and harmful myths of modern times a thorough debunking. Exposing the truth that there is no scientific grounding to the idea that depression is caused by a chemical imbalance is essential if we are to develop a more constructive response to psychological distress and suffering.” Dr. Joanna Moncrieff, psychiatrist and author, UK. “Everyone who wants to know the true facts will want to read this book.” Mary Maddock, mental health activist and author, co-founder of MindFreedom Ireland. “Thorough and principled . . Read it for essential enlightenment about one of the most damaging myths of our time.” Dr. Lucy Johnstone, psychologist and author, UK. “A very helpful book. One of the great myths that many people have bought into is the ‘chemical imbalance’ theory of depression. Now I can happily point them to Terry’s book for a comprehensive account of how that myth was developed and sustained. Thank you!” Dr. Pat Bracken, psychiatrist and author, Ireland. “In debunking the myth of ‘biochemical imbalances’, Terry Lynch provides an inestimable service to the health professions and to humanity”. Dr. Peter Breggin, psychiatrist and author, USA. “It is such an impressive book. I shall recommend it wherever I can.” Mary Boyle, psychologist and author, UK. “Through extensive and valid research Terry takes the reader on an epic journey revealing why this myth needs to be eradicated.” Julie Leonovs, mental health activist, UK, MSc in Psychological Research Methods. “Groundbreaking . . I have never read a more accurate or frank account of the myths surrounding ‘mental illness’ . . fabulous . . as brilliant as Robert Whitaker’s Anatomy of an Epidemic.” Leonie Fennell, mental health activist, Ireland. “I urge everyone concerned about the issue to read this important book.” Ted Chabasinski, J.D., USA, attorney, psychiatric survivor, anti-psychiatry activist. “A triumph of clearly argued and accessibly rendered scientific information. All its readers will be richly rewarded.” Brent Slife, psychology professor, USA. “Please read this book . . your life or the life of someone you love may depend on it.” Kim Olver, licenced counselor and author, USA, President of William Glasser International. “Dr Terry Lynch is one of the rare gems who is not afraid to stand up and be counted. A must-read book for anyone with an interest in health”. Ramo Kabbani, journalist, UK, founder of Prozac Survivors Support Group. “Terry’s insights into the reasons why we become depressed should form an integral part of all mental health training.” Nick Redman, Survivor/Activist, UK. “Essential reading for those who experience or deal with depression, one of the most painful of human conditions.” Brian Lennon, psychologist, Ireland, Founder of William Glasser International. “A game changer. . Brilliant . . Essential reading. Highly recommended . . an incredible work . . the definitive book on ‘the chemical imbalance theory’.” R. B. (“Truthman 30”), mental health activist, Ireland.